Issue 7: Food | Nanooze! Nanotechnology is all around us—and not just in our computers and iPods. It’s in our food, the air we breathe, and lots of the stuff we use every day. Nanotechnology is everywhere and you might be surprised to find out that it isn’t new. Even before the first microscopes—and way before there were microscopes that can see things on the nanometer scale—we have been using nanotechnology. And sometimes we don’t even know it. Goofy foods like mayonnaise are made with nanotechnology. By whipping together the ingredients—eggs, oil and lemon juice—we produce emulsions from tiny drops of oil surrounded by water. 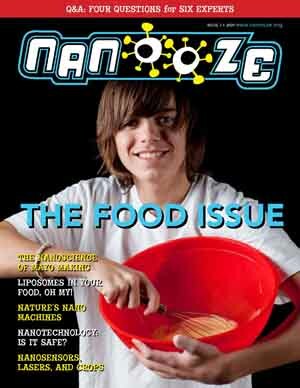 This issue of Nanooze is all about nanotechnology in food and agriculture. Nanotechnology already plays an important role in the food we eat and will become even more important as we learn how to apply it to agriculture and food production in the future. In this issue we’ll also discuss concerns about nanotechnology and what we might want to be on the lookout for. 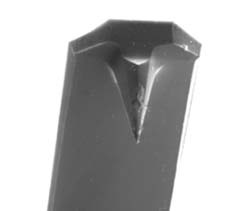 Because the products of nanotechnology are too small to see, sometimes we can’t avoid them or even know they are there. Six experts from around the world will share with us their different views of nanotechnology and how they think nanotechnology could change our lives.